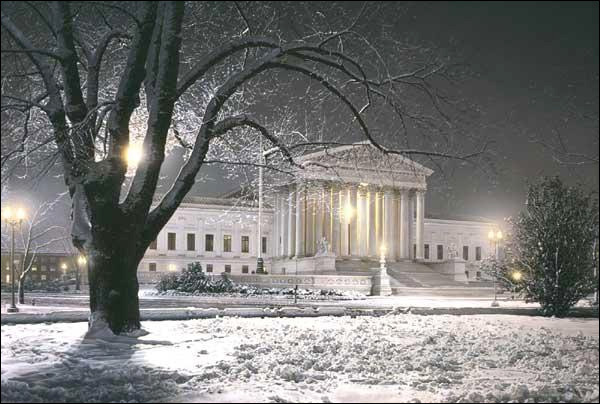 In preparing to paint this piece, the artist traveled to Washington, D.C., and visited the Supreme Court both in the morning and at twilight to study the detailing in the structure, the color of the building and its surroundings and to take detailed photographs of the area. Chase uses acrylics on canvas, often backing the canvas with board. Unlike most artists who block in color and rework the painting time after time, Chase completes each section of the painting before moving on to the next. Although he works almost exclusively from photographs, he takes artistic license by moving trees, branches or lights to enhance the composition as a whole. The snow in the foreground of this painting is simply amazing — crunchy and crystalline — and reminds Chase of his boyhood in Canada, where snow like this was a constant companion. Justice for All is the third painting in Rod Chase's Foundations of Freedom series. Justice for All copyright© 2003 by Rod Chase is prohibited from being copied. Web pages copyright© 1998-2009 by Christ-Centered Art. All Rights Reserved. 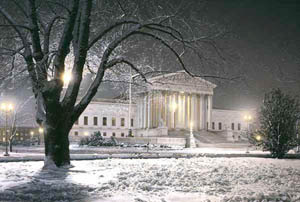 Rod Chase art, Foundations of Freedom series, Supreme Court, Washington D.C., historical landmarks, patriotic, Americana, artwork, art work, canvases, images, paintings, pictures, and prints of Justice for All by artist Rod Chase for sale. Justice for All painting by artist Rod Chase can be purchased in art print or canvas form at special sale prices at Christ-Centered Art.